Kondo has authored an international bestselling book of home organizing advice, and is also the star of a new Netflix show called Tidying Up With Marie Kondo. Perhaps you’ve seen your own friends and relatives on social media sharing their latest photos from decluttering and tidying up their own homes, Kondo-style. 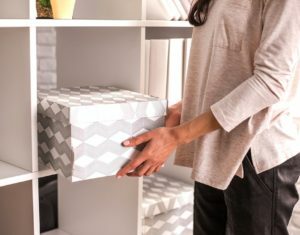 There’s something so refreshing and energizing about the idea of organizing your house, getting rid of unwanted clutter, and living a simpler existence; Marie Kondo has created a global sensation with her advice to only keep happiness-inducing items that “spark joy” for you, to carefully fold each item in your clothing drawers in a way that saves space and makes each item easy to find, and to “thank” the discarded items that you give away at the end. One of the biggest mistakes many solopreneurs and small business owners make is believing they need to go after every single client and chase down every last dollar. The truth is, not every customer is right for you. Everyone has clients who take up too much time and energy for too little reward. Do your clients spark joy or drag you down? If you can get better at getting rid of clients who aren’t quite the right fit, or who take up more energy than they’re worth, you will have more energy to deepen relationships with your best clients—plus you’ll have more fun and make more money, too! Are you using brochures that are outdated? Are there steps in your sales process that have much lower conversion rates? Are you satisfied with your CRM system or other sales tools, or would you be open to trying some new, simpler software? Is there a sales conference or trade show that you always exhibit at, just out of a sense of tradition, even though you’re not getting the results you hope for? Is there a part of your sales process that feels clunky or outdated, but you keep doing it “because that’s how it’s always been done”? Just like Marie Kondo tidies up and brings order to a cluttered home, you can improve your sales process so it runs more smoothly. Go back to first principles: If you had to design your sales funnel today for the first time, starting from zero, what would it look like? How long has it been since you updated your sales call scripts, your company mission statement, or your elevator pitch? You’d be surprised at the amount of antiquated jargon that can creep into your sales pitch over the years, without you even realizing it. Take time each year to take a fresh look at your entire sales process and adjust as needed.